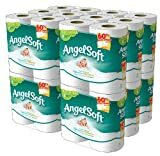 Angel Soft Toilet Tissue At Just $0.21 Per Roll! at just $0.21 per roll equivalent! The 48 double rolls equal 96 regular rolls and are available at $21.50 when you sign up for Subscribe and Save (remember that you can cancel at any time). Log into your Amazon account to get the additional $1 discount coupon and the price goes right down to $20.50 – that is $0.21 per single roll equivalent! Today Only: Get a One-Year Subscription to Parenting: The Early Years for just $4.99!